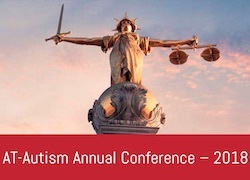 AT-Autism’s annual conference on ‘Rough Justice? How is the justice system serving autistic people?’ was distressing for many of the autistics attending (and some had to leave because of it). Most of the presentations were about tinkering on the edges of the system: improving prisons, the Broadmoor high secure psychiatric hospital, probation services, etc. Very little was said about changing a system that discriminates and oppresses the autistic minority. It is likely that the lack of openly autistic speakers contributed to this. Gary McKinnon and Lauri Love, whose extradition to the USA were both blocked, were mentioned several times. However Talha Ahsan who was extradited a week before Gary McKinnon’s extradition was blocked was only mentioned when I did in a question. There was no talk of intersectionality, even though autistics are not all white men! No presentation either was about the injustice of all the innocent autistics caught in the criminal justice system. My unlawful arrest by the Metropolitan Police Service, that luckily didn’t go to court, was so traumatic that it has been life changing. It is difficult to imagine what the fellow autistics who have had to or are going through court, prison, secure hospitals, probation, etc., many of them innocent of the offence they are suspected of or charged of, have to endure. Even some autistics convicted and sentenced to a life term for murder have not committed the crime for which they have been convicted for, such as is the case for Alex Henry, thanks to the law of joint enterprise. Kleio Cossburn, a former police officer, made a very interesting presentation in which she talked about how she found, after a traffic accident, how different things were on the other side of the desk where police officers usually sit. However not many police officers experience this, and fewer realise the trauma they often cause when arresting autistics, especially when innocent. Karen Todner, in her fascinating and harrowing presentation of several of the cases she has worked on, pointed out that when she started her 30-years career legal aid solicitor offered as good representation as private ones, and prison was a safe environment. This is no longer the case. She quoted a probation officer describing the current situation as: ‘we have gone back to the dark ages and we lock up those who are autistic because we don’t know what to do with them’. And that includes innocent, black, women, muslim, etc. autistics, not just autistic white men having committed an offence. We don’t need more autistics having a better time in the criminal justice system, we need a system in which autistics are not locked up. Currently, there are no effective medical treatments for the core symptoms of Autism Spectrum Disorder. Our overall goal is to address these shortcomings by adopting a precision-medicine approach to better target treatments to patients through the use of validated stratification biomarkers and by testing novel or repurposed drugs. *I mentioned to Joe Lo the Tree House Town Hall 2008 talk by Bob Wright, the ex-Chairman and founder of Autism Speaks, in which he explained ‘I see autism through the lens of cancer’. (The video is a bit shaky, but it’s wonderful to see Jon Snow encouraging all present to flap.) That talk followed Something About Us, an excellent film about the rights and voice of autistic people by Dinah Murray and Jes Benstock. This post explores how repair activities and, more specifically, community repair events are well suited to many autistics and other neurodivergents, and how to ensure that these events are welcoming to all neurodivergents. Its content is based on notes that have been refined in presentations and discussions at Fixfest 2017, Fixfest UK 2018 and the PARC Autistic Fringe (Glasgow) 2018. Are repair events inclusive for everyone? Do they involve people who might otherwise feel isolated? (*) Spoons refer to Christine Miserandino’ spoon theory, a metaphor for managing one’s energy. Spudgers are flat plastic or metal tools essential to open most electronic devices (and apparently originating from late Middle English spuddle (“short knife”). The Restart Project helps people learn how to repair their broken electronics, through our Restart Parties: free community repair events where participants can work with a skilled volunteer to fix anything with a plug or a battery. They’re spaces for learning skills and reflecting about how we consume in the first place. Repair is fun, it’s social, it saves money, and helps us be creative and constantly learn. The Restart Project has been proactive in encouraging inclusivity across genders, in particular with the Rosie the Restarter skill shares. Nothing similar yet exists for neurodivergents. Autistics have spiky profiles, an unusual combination of abilities and challenges. Autistics can find some tasks easy and others difficult, and this may change depending not just on the task, but also on the environment, and recent experiences. It is common for autistics to be over (hyper) and/or under (hypo) sensitive to some of their senses; and there are more than five, e.g., sight, hearing, taste, smell, touch, temperature, pain, kinaesthetic sense (proprioception), balance, etc. Processing sensory information can be overwhelming. An Auternative: A Society Fit for Autistics is a research project funded by Disability Research for Independent Living and Learning (DRILL) which aims to create recommendations for overcoming the barriers faced by autistic people, challenging the prevalent stereotypes and enabling autistic people to take their place in the world. The research, of which I am a partner, is being carried-out by an autistic-led group consisting mainly of autistic people and has an all-autistic advisory committee. We have now published our questionnaire and are looking for autistics, 16+ year old, participants. If you are autistic, please fill in our questionnaire. We’d also appreciate if you can promote it to other autistics you are in touch with and/or through your social media. 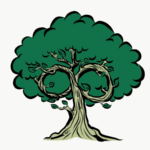 This post appeared first on the Participatory Autism Research Collective (PARC) blog. As so little information has been made available on 115 million euros Autism Innovative Medicine Studies-2-Trials (AIMS-2-Trials) research project, we suggested to Autistica to publish their project agreement. They didn’t. Using the access to information scheme of the Innovative Medicines Initiative 2 Joint Undertaking (IMI2 JU), we also requested a copy of the ‘Autism Innovative Medicine Studies-2‐Trials (AlMS-2-Trials) grant agreement and its appendices’. After extending its deadline, the IMI2 JU sent us a partly redacted copy of the grant agreement. The redactions are explained in a cover letter. The grant agreement document, even redacted, weighs in at 19 MB and 664 pages [The linked document is now only 112 page long; see the Update 2018-10-24 at the bottom of this post for an explanation; note that the page numbers indicated in the post were referring to the original document]. To help all those curious about this project to get a quick grasp on the project priorities, its ethical commitments and how it will involve autistic people, we are providing a summary in the form of a FAQ. 1. Will AIMS-2-Trials address the autism community’s priorities? ‘Currently, there are no effective medical treatments for the core symptoms of ASD […] Our overall goal is to address these shortcomings by adopting a precision medicine approach to better target treatments to patients through the use of validated stratification biomarkers, and by testing novel or repurposed drugs in a highly trained European-wide clinical trials network for ASD that links to other international efforts’ (p. 165). None of the top 10 autism community’s research priorities include ‘treatment for the core symptoms of ASD’. 2. Will AIMS-2-Trials really only target the core symptoms of ASD? For instance, epilepsy is an important co-morbidity for autistic people that has a large impact on their quality of life and is likely well suited for a pharmaceutical intervention. The grant agreement briefly acknowledges this: ‘We also specifically include younger populations, and target core symptoms that are relatively under investigated together with associated symptoms impacting on quality of life and mortality (e.g. epilepsy).’ (p. 184). Searching for ‘epilepsy’ reveals that out of all the seven work packages, out of the 34 deliverables of Work Package 2 ‘Validation of stratification biomarkers’, only three deliverables are about epilepsy: 'D2.4-6 Epilepsy: First study subject approvals package completed (registered in WHO or ICMJE, Ethics approvals delivered to the IMI); Midterm recruitment report; Report on status of posting results’ (p. 117). 3. Has AIMS-2-Trials an ethics board? Yes. Two ethics board are described. The 'External Ethics Advisory Board (EEAB). The EEAB will report to the SSC [Study Steering Committee]. An external independent ethics advisor (Professor John Suckling) has been appointed to oversee, with impartiality, the ethical concerns involved in this research. He will chair the board and be supported by a Deputy Director (Prof. Dr. Marcella Rietschel, University of Heidelberg) and other relevant experts including Prof Dr Ulrike Schulze, Zentrum für Psychiatrie Baden-Würtemberg.’ (p. 198). And the 'Data Monitoring and Ethics Board (DMEB). The DMEB will report to the SSC. There will be an independent DMEB that consists of a researcher/clinician with expertise in ASD, a statistical expert, and an ethical expert. The DMEB operates in accordance with a charter that follows the guidelines of the DAMOCLES study group for charters on clinical trial data monitoring committees . The aim of the DMEB is to protect and serve the clinical study participants (especially re: safety) and to assist and advise the TSB [Trial Steering Board] as to protect the validity and credibility of the clinical study/trial. The DMEB will receive a summary report of the study progress every 6 months, and review the progress and accruing data of this trial and provide advice on the conduct of the trial to the TSB. To this purpose, the DMEB will meet face-2-face or by teleconference not later than within 6 months after the start of the study and thereafter every 4 months or more often if needed. The DMEB will support risk management and review incidents associated with data collection (including brain imaging) of vulnerable participants, as well as monitoring data curation and stewardship. This will run in parallel with the institutional Clinical Governance system which oversees clinical and radiological safety issues.’ (pp. 198 and 403). 4. Was ethics an overriding concern of AIMS-2-Trials? The Ethics requirements work package (WP7) was a late add-on to the agreement. The history of changes shows that ‘An Ethics WP has been added: WP7 with deliverables D7.1-8’ (p. 162). This change is listed as having been introduced in version 6 of that part of the agreement, which is dated 2018-06-13, just five days before the project’s launch press-release. 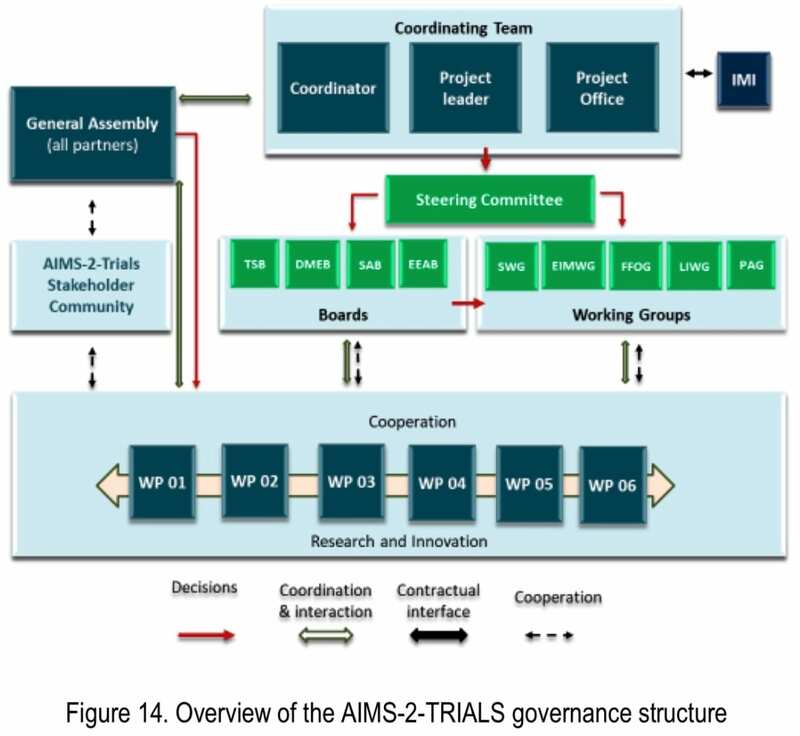 ‘Figure 14 Overview of the AIMS-2-TRIALS governance structure’ still only shows six work packages (p. 197). WP7 is the only work package which still has no figure (‘N/A’) listed for its ‘total number of person-months allocated’ to it (p. 94). All of the eight deliverables of WP7 (defined as GEN – Requirements No. 11 to 18) will be ‘Confidential only for members of the consortium (including the Commission Services)’ (pp. 147-148). The second paragraph in a section on ethics explains the overall approach as: 'Any consideration of ethical issues has to be set in a context of the potential benefits and risks of the overall project. Undoubtedly, better options are needed for treating ASD. AIMS-2-TRIALS will address this issue using the latest techniques of animal and cellular models, genetics, proteomics, imaging and behavioural/cognitive phenotyping.’ (p. 309). That seems to indicate that the benefits and risks of the project may overrule any ethical concern. (‘benefit’ is used on 30 pages, but with no clear definition, nor a list of what may be the benefits of AIMS-2-Trials for autistic people. For instance, here’s another use in the context of actions for investors: ‘the Actions include ‘Sensitize investors to AIMS-2-TRIALS potential benefit to patients and market opportunity, to support commercial ramp-up post regulatory clearance.’ p. 192). The secrecy about the project’s approach to ethics goes further. Although the grant agreement mentions 'Activities raising ethical issues must comply with the ‘ethics requirements’ set out as deliverables in Annex 1.’ (p. 59), the covering letter to the redacted agreement explains 'the Annex 1 is withheld in its entirety considering that access to a redacted document would be meaningless;’ (I have requested a review of that redaction, and a response is due by 2018-10-05). 5. Will the ‘universities, research organisations, public bodies [and] non-profit groups’ involved receive any funding? The IMI will distribute 55 million and one euros to them. King's College London will receive 20 060 301 euros. The second largest recipient, Servicio Madrileno De Salud-Fibhug, will receive 5 502 025 euros. IMI2 has published the full list on its AIMS-2-Trials summary page. I’ve also updated the spreadsheet I had published earlier with this information. 6. Will the associated partners – Autism Speaks, Autistica and SFARI – receive any funding? No, none of them will receive any of the IMI funding, however, they will receive benefits in kind. 7. Will autistic people be involved? Yes, a few though this is still to happen. Some autistic persons will be invited to be part of an Autism Representatives Group (A-Reps) and a Patient Advisory Group (PAG); at most one autistic person from each EU country is to be invited to the A-Reps. Of course a few researchers from the organisations involved may also be autistic (at least one openly identifies as autistic). ‘To ensure full collaboration with the autism community, we will create an Autism Representatives Group (A-Reps), using Autistica’s DISCOVER Research Network, to ensure patient and public involvement (PPI) with autistic people, their families and relevant stake-holders (e.g. autism charities, autism-related professionals) across Europe. The A-Reps group will include representatives from EU countries (an autistic person/family member, and a charity/professional rep in each country).’ (p. 135). 'The PAG [Patient Advisory Group] will report to the SAB [Scientific Advisory Board]. It will consist of representatives from patient organisations and individuals with first hand knowledge of ASD. We have agreements from Autism Europe and Autistica, who will work together with our Autism Representatives Group (A-Reps) that includes representatives from the Catalonian Autism Society, Gautena society, Federation Autism Madrid, Dutch Autism Society, and the Phelan McDermid Syndrome Foundation. The PAG will provide a focus of expertise in patient experience, and offer a natural vehicle for patient engagement in the consortium’s activities. It will meet formally once a year as part of the General Assembly meetings.’ (p. 199). Note that the organisations that will be represented on the ‘Patient Advisory Group’ are not autistic organisations. 8. What is this patient and public involvement (PPI) the A-Reps will participate to? A focus of outreach will be the Autism Representatives Group (including autistic individuals, parents/carers, special educators, clinicians and researchers from across Europe (based on Autistica’s Discover Network; https: //www.autistica.org.uk/our-research/discover-network). In addition, our collaborative effort with co-leads Autistica and Autism Europe and our new Autism Representatives Group will ensure that we include as many Autism Charities in our network as possible. A number of charities across Europe, including those affiliated with Autism Europe such as Aprenem Associacio per a la inclusio de persones amb Transtorn de |’Especter [sic] Autista, Gaurema [sic] (San Sebastian, Spain), Nuevo Horizonte, Phelan McDermid Syndrome Foundation and The Dutch Autism Society, have already agreed to be part of our network. These organisations will be working with us on dissemination and patient and public involvement workshops to receive input from and provide information to the community. This will assist in the effective dissemination of information on educational events, policy initiatives, and newsletters (involving news updates on research, policy, education and other relevant materials). All these efforts will also be available on the new website and through the collaborative dissemination strategy with Autistica, Autism Europe and other partners. We will ensure that feedback is provided to the autism community and other citizens on how these groups interact to provide example of collaborative efforts for other projects, using a framework set-up by Shaping Autism Research (http://www. shapingautismresearch.co.uk).' (pp. 135-136). 9. Are there really 48 participants? In Attempting to lift the veil of secrecy over AIMS-2 we published the authoritative list of 48 participants we had received from IMI2. The AIMS-2-Trials summary page now lists a 49th organisation: Greater Glasgow Health Board. However it is listed separately as a ‘Third parties’ (despite the plural, there’s only one). It will receive 195 000 euros of IMI funding. The grant agreement document mentions ‘Greater Glasgow and Clyde Health Board’ (p. 275). This explains why the AIMS-2-Trials press release includes a logo for NHS Greater Glasgow and Clyde. If after having read this FAQ and perused the grant agreement, this is a research project you want to support contact AIMS-2-Trials with your offer of participation. You can also contact your Member of the European Parliament. Following this assessment, I am pleased to inform you that I have concluded that the part of Annex 1 of the Grant Agreement that relates to the ethics requirements may be partially disclosed, with some of its parts redacted based on Article 4(1) (b) of Regulation (EC) No 1049/2001 (protection of personal data). Two documents were attached: the Ethics-related excerpt of ANNEX I of the AIMS-2-TRIALS Grant Agreement (partly redacted) and the Work Package 7, described in Annex 1 of the AIMS-2-TRIALS Grant Agreement. In fact this information was already included in the redacted grant agreement that had been sent earlier. Some further redactions have been applied to the documents received today, but the documents have copy/paste enabled making it easier to quote from them. So no further analysis needed. It has come to our attention that, contrary to what was stated in the letter responding to your first request of access to document, the file named ‘Full grant agreement redacted’ sent to you on 10 September 2018 included the annex 1 of the AIMS 2 TRIALS of the grant agreement. This information was shared with you inadvertently. By publishing it on the internet this is now disclosing sensitive commercial information and personal data which were not intended for publication and for which you do not have any right to publish. We therefore have to ask you to immediately remove the file from your internet page at the following link: http://gizmonaut.net/autism-documents/Full-Grant-Agreement-777394-AIMS-2-TRIALS_redacted.pdf. I have replaced the content of the file with a heavily redacted one reduced from 664 to 112 pages. The Autism Innovative Medicine Studies-2-Trials (AIMS-2-Trials) was launched as the largest ever grant given to autism research on June 18th. Two weeks ago, we wrote some questions about this project and the autistic representation and monitoring, if any. Dr James Cusack, Director of Science, Autistica wrote a response that answered only some of our questions. Some people commented on both these posts (below each). A key issue that appears pervasive with this project is the secrecy surrounding it. For any monitoring of AIMS-2 to be effective, a monitoring panel would need to a) have access to internal documents and staff of AIMS-2 projects, and b) be able to discuss them publicly. Otherwise either those doing the monitoring will not be able to understand what is happening or they will only be able to express that they have concerns or none, without being able to say about what! Autistica will contribute £50,00 in-kind (equivalent to €56,274 at the exchange rate on the day I converted it). In-kind contributions from autism charities (the Simons Foundation, Autism Speaks and Autistica) combined will be €55.5 million. And the AIMS-2 grant is €115 million. That means that Autistica’s contribution is about 0.1% of the in-kind contributions from autism charities and less than 0.05% of the total grant; clearly any power that Autistica wields in that consortium is not financial. This makes the release of their agreement with AIMS-2 all the more important and it would help restore some of the lost trust. Some of the discrepancies have likely explanations. For instance the logos for 'KIND Center of neurodevelopmental disorders at Karolinska Institutet’ and for 'Karolinska Institutet’ likely are both for the same organisation (entry 21 of the table). For some it is possible that a logo, e.g., for the 'Nuffield Department of Clinical Neurosciences’ may correspond to that of a participant appearing under a different name (entry 11). However these are just guesses and do not explain all these discrepancies. For instance the 'NHS Greater Glasgow and Clyde’ whose logo features on the press release does not seem to fit with any of the participants on the allegedly authoritative list. Same goes for the logos of the Donders Institute and the Radboud University. Could there be such a gross error in the press release? Or could there be more than 48 participants? We cannot say with the information currently available. And all that confusion is just about the basic information that is the list of participating organisations in the AIMS-2 consortium. If it is so difficult to get such basic information out of AIMS-2, getting access to what is needed for effective monitoring will require an enormous effort at best. Dr Will Spooren, the EU-AIMS project coordinator (also Group Leader Behavioral Pharmacology at Hoffmann-La Roche) wrote a presentation, titled Precision Medicine Approaches in Autism Spectrum Disorders, giving a bit more details on AIMS-2. This does not mention ethics or autistic participation. Dr Spooren is also a co-author with Professor Dr Declan Murphy, EU-AIMS academic lead, and lead author Dr. Eva Loth, EU-AIMS project coordination, of a related paper titled Defining Precision Medicine Approaches to Autism Spectrum Disorders: Concepts and Challenges. This mentions ethics once: ‘A treatment that is likely only effective in early development would raise important ethical implications for clinical trial designs that usually first test safety, efficacy and side-effects in adults.’ According to these two documents, their only ethical concern is testing drugs on babies, and that would only raise ethical implications so would still be considered. And no mention of autistic involvement either. So the situation a month and half after launch is we’ve managed to get a list of participants, but found discrepancies with the press release that remain unexplained. We found some further documents that demonstrate little attention to ethical concerns and no interest in autistic participation, other than as test subjects. There is no information at all on the agreement between participants. Autistica is talking about convening a committee to select a panel, but with a lack of clarity on its composition (it could be made of a minority of autistics from what is currently known) and no information on how any monitoring panel can be effective: this does not bode well. Your application is currently being handled. However, we will not be in a position to complete the handling of your application within the time limit of 15 working days, which expires on 21/08/2018. An extended time limit is needed due to the volume of the relevant documentation, some of which originates from third parties which have to be consulted. Therefore, we have to extend the time limit for 15 working days in accordance with Article 4(3) of the IMI Governing Board Decision IMI-GB-036-24092008 and Article 7(3) of Regulation (EC) No 1049/2001 regarding public access to documents. The new time limit expires on 11/09/2018. > Or could there be more than 48 participants? It involves 75+ partners across Europe, including academic institutions, industry partners, and charities. So from 38 logos on the initial publication of the AIMS-2 press release, to 48 on the allegedly authoritative list of participants I received, we’re now jumping to 75+ partners, and that’s just for Europe (i.e., not counting the South African, Israeli and American participating organisations). Last month, the Autism Innovative Medicine Studies-2-Trials (AIMS-2-Trials) was launched as the largest ever grant given to autism research – €115 million, with money coming from the EU, pharmaceutical companies and charities. A month has passed and little has been clarified about what exactly this project is and what autistic involvement there will be. The Annual Activity Report 2017 of the Innovative Medicines Initiative describes AIMS-2, under its IMI2 Call 10’ as ‘Personalised medicine approaches in autism spectrum disorders’. It is no wonder that a project on personalised medicine attracts big pharma. If you take a world-wide prevalence rate of autism of 3%, admittedly a slightly high one but it makes calculations easier, then if a participating lab is trying to develop a drug targeting a third of autistics, that drug could be sold to 1% of the world population. New genomic drugs do fit several of the strategic research agenda items though: biomarkers to identify autistics, trials of innovative drugs… and compliance with treatment. Autistica stated that it is getting involved to ‘ensure that AIMS-2-TRIALS focuses on community priorities and involves autistic people and families at every stage.’ It is ‘contributing £50,000 in staff time and resources’. Which environments/supports are most appropriate in terms of achieving the best education/life/social skills outcomes in autistic people? How can parents and family members be supported/ educated to care for and better understand an autistic relative? How can we encourage employers to apply person-centred interventions and support to help autistic people maximise their potential and performance in the workplace? Personalised medicine approaches don’t seem to fit with these community priorities. How will this be reconciled? We are creating a Europe-wide representative panel which can hopefully act as an independent voice on the project, make suggestions and consider approach in terms of policy. It’s not ideal as a mechanism for involvement, but it is better than what would have been there if we were not involved. The ‘we’ is Autistica aspiring to represent autistic people in the context of this vast project. Even though they employ an autistic Director of Science, James Cusack, and even though they have been drawing on more and more autistic support over the last few years, can they possibly get this right? At the moment many of those autistic people –who had for example reviewed research proposals, contributed to discussions, given their time towards projects, suggested lines of research, benefitted from grants, joined Autistica’s Discover network; and felt valued– are suffering a sense of betrayal. Yet in the bigger picture of the AIMS-2, Autistica is positioning itself as delivering our voice to the project. This remains very vague. What will be the process to select autistics, what will be their access to AIMS-2 documents and people, what will be their power, what confidentiality agreement will they have to sign, etc. Nothing yet concrete that indicates autistics will have a meaningful voice. At this point, we need to give Autistica the benefit of the doubt and encourage them to extract the best possible outcome, i.e. to aim as high as possible to get more effective autistic representation and scrutiny on the project. be able to call on AIMS-2 members to present on their work and answer questions. This is a concern as Autism Europe is not led by autistics and Autistica should be working with autistic-led organisations in all European countries. AIMS-2-Trials brings together autistic people and their families, academic institutions, charities and pharmaceutical companies to study autism and provide an infrastructure for developing and testing new therapies. The embryonic websites lists some of the partners but not who are these ‘autistic people and their families’. This may come later! All autistic people are different which makes identifying and testing new therapies challenging. AIMS-2-Trials will take a precision medicine approach aimed at tailoring therapies to a person’s biological profiles. Achieving this will require developing tests that can predict how a person’s autism may progress throughout development and their likelihood of developing additional mental health problems. Another concern is who are the partners. The press release states that there are 48 partners… and lists the logos of 38. Ten partners are missing. Who are they? Update 2018-08-02: See the Response from Dr. James Cusack to concerns regarding Autistica’s involvement in AIMS-2 on the PARC blog. When do the police find a detainee vulnerable and an appropriate adult is called? The Home Office ran a consultation last year about changes to the Police and Criminal Evidence Act 1984 (‘PACE’) Codes of Practice. One proposed change was about when does an officer decides a suspect is vulnerable, which triggers the requirement for an appropriate adult (AA) to be present for key aspects of the suspect’s time in custody such as their police interview. 1.4 If an officer has any suspicion, or is told in good faith, that a person of any age may be mentally disordered or otherwise mentally vulnerable, in the absence of clear evidence to dispel that suspicion, the person shall be treated as such for the purposes of this Code. See Note 1G. 1.4 If at any time an officer has a reason to believe that a person is a ‘vulnerable adult’ (see paragraph 1.13(d)), in the absence of clear evidence to the contrary, the person shall be treated as such for the purposes of this Code. See Note 1G. From my experience as both an Independent Custody Visitor (ICV) and being autistic, I find the proposed change to section 1.4 of PACE Code C particularly concerning. The change from 'has any suspicion, or is told in good faith,’ to the much higher standard 'has a reason to believe’ means that there would now be a strong presumption against calling an Appropriate Adult (AA) as an officer would have to reach the higher threshold of ‘a reason to believe’ to consider the detainee to be vulnerable and that an AA is needed. Also disregarding ‘is told in good faith’ would be disempowering for the detainee and start the relationship by showing disrespect. Disabilities can be part of someone’s identity. So for instance no longer accepting an autistic detainee telling a custody sergeant they are autistic ‘in good faith’ would be denying their identity. In addition to the lack of respect, by being adversarial about the detainee’s identity and/or lived experience this might negatively affect cooperation and further stress the detainee. Such a change to section 1.4 would also affect monitoring of whether an AA is called when one must. ICVs, for instance, wouldn’t be able to ensure that an AA has been called for detainees that appear to them to be vulnerable or tell them in good faith they are vulnerable, as an ICV cannot know the custody sergeant and/or interviewing officer’s belief, which is how a detainee would be deemed to be vulnerable.That what a detainee may say in good faith about their vulnerability would no longer be relevant will mean, if these changes happen, that ICVs will likely encounter situations where a detainee tells the ICVs that their vulnerability has been ignored while the custody sergeant tells ICVs they don’t believe that detainee to be vulnerable, basically creating an impossible situation where a detainee would have to prove their vulnerability to get access to an AA. (c) the record mentioned in sub-paragraph (b) shall be made available to be taken into account by police officers, police staff and any others who, in accordance with the provisions of this or any other Code, are required or entitled to communicate with the person in question. This would include any solicitor, appropriate adult and health care professional and is particularly relevant to communication by telephone or by means of a live link (see paragraphs 12.9A (interviews), 13.12 (interpretation), and 15.3C, 15.11A, 15.11B, 15.11C and 15.11D (reviews and extension of detention)). See Notes 1G, 1GA, 1GB and 1GC. the exercise of their rights and entitlements. readily agreeing to suggestions or proposals without any protest or question. 1G A person may be vulnerable as a result of a having a mental health condition or mental disorder. Similarly, simply because an individual does not have, or is not known to have, any such condition or disorder, does not mean that they are not vulnerable for the purposes of this Code. It is therefore important that the custody officer in the case of a detained person or the officer investigating the offence in the case of a person who has not been arrested or detained, as appropriate, considers on a case by case basis, whether any of the factors described in paragraph 1.13(d) might apply to the person in question. In doing so, the officer must take into account the particular circumstances of the individual and how the nature of the investigation might affect them and bear in mind that juveniles, by virtue of their age will always require an appropriate adult. information from health and social care (including liaison and diversion services) and other professionals who know, or have had previous contact with, the individual and may be able to contribute to assessing their need for help and support from an appropriate adult. This includes contacts and assessments arranged by the police or at the request of the individual or (as applicable) their appropriate adult or solicitor. Update 2018-07-14: Following the publication of the The Police and Criminal Evidence Act 1984 (Codes of Practice) (Revision of Codes C, E, F, and H) Order 2018, the revised codes will come into force on 2018-07-31. (On that date, the updated versions will also be added to the Police and Criminal Evidence Act 1984 (PACE) codes of practice web page). Update 2018-07-31: The National Appropriate Adult Network (NAAN) has published an excellent detailed guide to the PACE Codes changes (PDF). WhatDoTheyKnow, the website created by mySociety to help make Freedom of Information requests and share the responses, was launched ten years ago. As part of the birthday celebrations, 50 significant news stories that have been uncovered through the site were published. Very happy birthday to WhatDoTheyKnow!